It draws a higher current than BUF634 as well but not much. 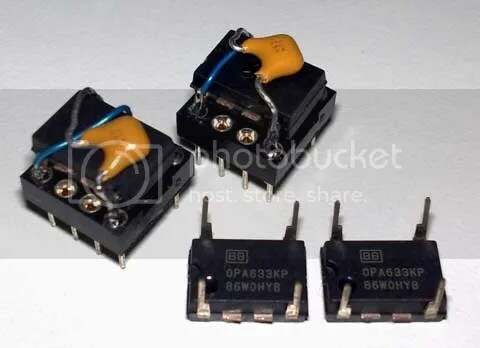 The Pin out of OPA633 is unconventional, It is not the same as any other op-amp. And hence we need to bend the pins. By inverting the 4 connected pin it would fit nicely into the D10 without even soldering. Show in the picture are 2 simple modification and 2 with supply caps and double bypass. How does it sound (compared to BUF634), It is more detailed, more air around the instrument and vocal but and slightly brighter. Pair better with my UM3X. But for my HD595 I prefer the BUF634. There is a however very slight hiss on opa633. I have got the D10 as well. I was trying to put the opa633 into. Do I just bent the pin 1,4,5,8 and inset them into the DIP8 socket and will that work? It something like what you mention, just make sure that the Ground goes to ground and the Vcc goes to the Vcc. After turning the OP-AMP around it could get confusing.